TORONTO, ON: With Valentine’s Day approaching, love is in the air. With approximately 2/3 of one’s day being spent at work it’s only natural for relationships to develop in the workplace. Completing successful projects, taking lunch breaks and working in a close environment together can contribute to sparks! 1. 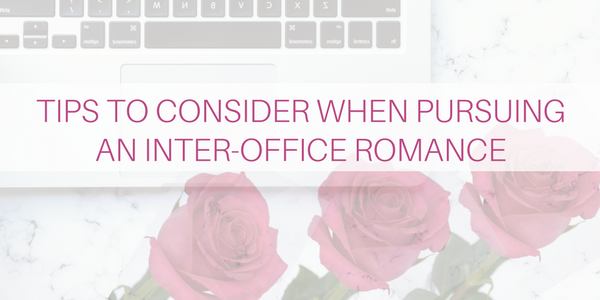 Investigate Company Policies:It’s important to find out what the organization’s stance is on inter-office dating before jumping into a relationship with a colleague. If you are serious about pursuing the relationship, it’s important to inform your boss before they find out by way of “water cooler gossip”. 2. Be honest and share your intentions: It’s important for you and your partner to be in the relationship for the right reasons. Share your viewpoints on relationship expectations, how you will interact in the workplace, avoiding workplace biases and how the relationship could potentially impact your careers. 3. Keep your relationship private: Keeping the details of your relationship private will ensure you keep the focus on your professional abilities and performance. Avoid intimate contact and make sure guidelines are set up front to ensure you are both on the same page to ensure that problems don’t arise that may affect your job. 4. “Breaking up is Hard to Do”: Dating a co-worker or boss might seem like a great idea at first, however, think about the repercussions if the relationship ends in failure. Entering into a relationship with someone you work with that ends on a sour note could lead to tension in the workplace. Maintaining separation between your professional and personal life is important. Consider moving to another department or location if your company allows. 5. Keep Social Networking in Mind: In today’s society information travels fast. Ensure that your professional and personal profiles are kept separately on Facebook, Twitter and other social networking tools. You never know who might be connected to you that could break the silence of your new relationship. TorontoJobs.ca is a full-service recruitment organization, including TorontoJobs.ca Website, Full-Service Recruitment Division and Outplacement Services. Our local focus and advanced features make TorontoJobs.ca a vital asset for both job seekers and employers within the Greater Toronto Area.